Several plot elements come together here to create quite an enjoyable picture. Nazi war criminal Heinrich Stubel, alias Count Pfefferman (Sig Ruman), is offing hotel managers at an alarming rate in the hope that he will be appointed manager himself (he has ulterior motives). Unfortunately, when he is finally offered the job he is indisposed because Stubel's valet Rusty (Harpo) has sucked his hairpiece into a vacuum cleaner, thus exposing an incriminating scar on Stubel's head. Instead, the position is offered to the unsuspecting Ronald Kornblow (Groucho), who takes to it with gusto and gleefully insults staff and guests alike. 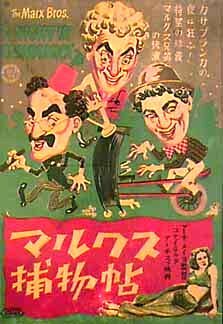 Rusty overhears of a plot to assassinate Kornblow, and he enlists the aid of itinerant camel jockey Corbaccio (Chico) to help protect Groucho from Stubel. Meanwhile, American flyboy Pierre Delmar (Charles Drake) is trying to get information on Stubel to clear his own name over an incident that happened during the war. Ever the altruists, Corbaccio and Rusty try to help Pierre as well, with disastrous results. 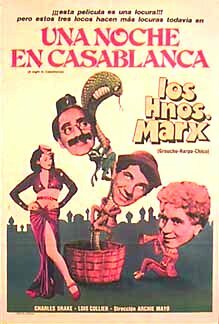 Time is telling on the Marxes in this picture, but it is an enjoyable romp nonetheless. 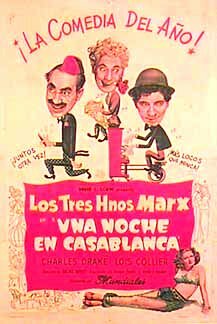 Groucho even manages to capture some of the zest of his earlier times as a hotel manager in "The Cocoanuts." Harpo's employment of Frank Tashlin (cartoon director/writer being among his hats) as a gag writer prompts some wonderful sight gags. It was during the final days of filming that Groucho realized he'd finally had enough. While hanging upside-down outside of an aeroplane during innumerable takes of one of the final scenes, Groucho decided once and for all that he was ready to retire. The others were ready as well. The three brothers would appear once more together, three years later, but really only as an afterthought. "A Night In Casablanca" was the last true Marx Brothers film. This movies obviously alludes to Warner Brothers movie Casablanca. 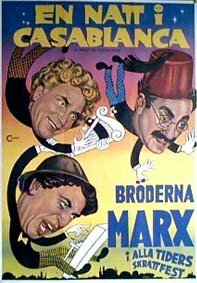 This lead to an exchange of letters between Groucho and Warner Brothers, because they allegedly were threatening to sue the Marx Brothers, which is not completely true. "Who's Sorry Now? 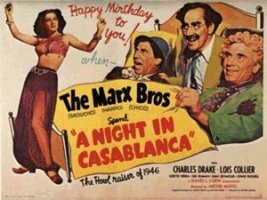 ", though it is performed in "Night in Casablanca," actually was written quite a few years before that, in the 1920's by Kalmar and Ruby, some time before their later association with the Marxes. According to Adamson, Kalmar and Ruby originally wrote the song as a joke, not wanting it released, but it got released without their permission and turned into a tremendous hit, more or less making their reputation and songwriters.